Fabulous Vintage Handcrafted Glass & Brass Seed Bead Lariat, Belt and/or Necklace. The bead work in this piece is top quality craftsmanship with a light blue, white glass seed bead design. 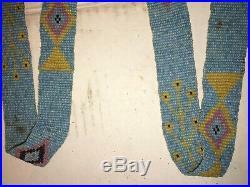 The belt/necklace is tied (toggle) together with two larger light blue glass beads with additional seed beads looping down. Unfortunately, I have no history on this piece, but the design looks as possible Native American and/or Flapper Style make? 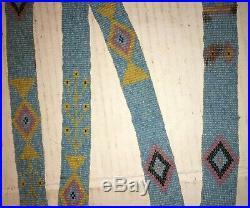 The bead work design has a spider pattern that gives it a Native American look and also has a Flapper look to it. Either way, this is a stunning piece! The length and design of this piece makes for versatile use. It measures approximately a total of 66 inches long and 3/4 inches wide and weighs 112 grams. It can be used as a Belt and/or Lariat. The long length makes for a variety of ways to wear as a necklace (see photos). Overall condition of this piece is excellent for its age with no missing pieces or breaks. An excellent vintage piece with versatility to add to any wardrobe or as an addition to a collection! The item “Vintage Handcrafted Blue White Glass Seed Bead Lariat Belt Necklace” is in sale since Tuesday, March 26, 2019. This item is in the category “Jewelry & Watches\Vintage & Antique Jewelry\Vintage Ethnic/Regional/Tribal\Other Vintage Ethnic Jewelry”. The seller is “mland” and is located in Richmond, Kentucky. This item can be shipped to United States, Canada, United Kingdom, Denmark, Romania, Slovakia, Bulgaria, Czech republic, Finland, Hungary, Latvia, Lithuania, Malta, Estonia, Australia, Greece, Portugal, Cyprus, Slovenia, Japan, China, Sweden, South Korea, Indonesia, Taiwan, South africa, Thailand, Belgium, France, Hong Kong, Ireland, Netherlands, Poland, Spain, Italy, Germany, Austria, Bahamas, Israel, Mexico, New Zealand, Philippines, Singapore, Switzerland, Norway, Saudi arabia, Ukraine, United arab emirates, Qatar, Kuwait, Bahrain, Croatia, Malaysia, Brazil, Chile, Colombia, Costa rica, Panama, Trinidad and tobago, Guatemala, El salvador, Honduras, Jamaica, Ecuador, Viet nam, Uruguay. 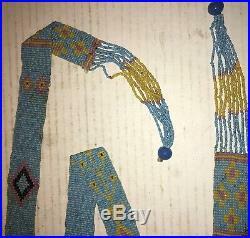 This entry was posted in vintage and tagged bead, belt, blue, glass, handcrafted, lariat, necklace, seed, vintage, white. Bookmark the permalink.